If you are able to visit the area, you'll find amazing sea birds, active volcanoes, fascinating native culture (the Aleuts are among the oldest continuously resident groups in the Americas) and a real sense of wilderness and wildness. The dock is within a 45 minute walking distance of town, 4km. Taxis available. Shuttles vans are often provided. On rare occasions tenders will be used. Unalaska, the 11th largest city in Alaska, is a bustling community of about 4,000 residents located along the Aleutian Chain, approximately 800 miles southwest of Anchorage. 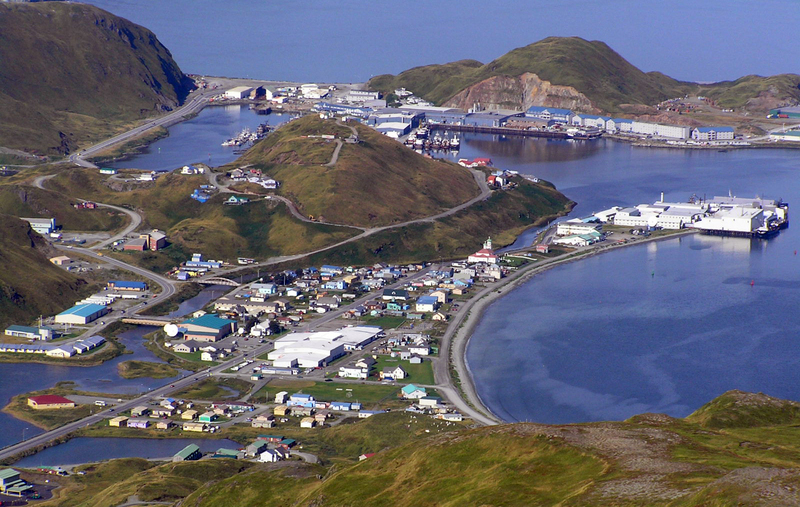 Dutch Harbor, the official name of the city's port, is often applied to the portion of the City of Unalaska located on Amaknak Island, which is connected by bridge to the rest of the community on Unalaska Island. Unalaska's economy is based on commercial fishing, fish processing, fleet services, and transportation. Because it is centrally located in the North Pacific directly on shipping routes between the West Coast and Pacific Rim nations, the city enjoys a strategic position near the center of the nation's most productive fishing grounds and is the hub of the transshipment of cargo between Pacific Rim trading partners. Located 800 miles from Anchorage, and approximately 80 square miles in size with an elevation as high as 6,680 feet at the top of Makushin Volcano. Dutch Harbor is the nation's top fishing port and has been for more than a decade. During your visit be sure to see the first Russian Orthodox Church, built in 1825. The cathedral was rebuilt in the mid-1850s as the new Russian Orthodox Cathedral of the Holy Ascension. This is the oldest Russian church still standing in Alaska and a National Historic Landmark. This is a place that you will get some nice views of wildlife including bald eagles. There are usually a few local tour operators at the dock to show off the sights of the village. The town’s shops offer fine quality crafts that reflect Dutch Harbor’s ties with the Russian Far East.